Recently I’ve been having long sessions of crayon art with my kids. Besides doing observational studies of their little faces in Lime Green, I’ve been thinking about how to push the boundary with such an unforgiving, plastic medium. I start thinking of fine artists that have excelled with flat, graphic and otherwise plastic effects of their art. Specifically painters. While Warhol of course came to mind, he actually didn’t do the painting himself – the lack of depth occurred from his distance to the medium – a silkscreen of a photo of a photo of a photo, then flattened with color. 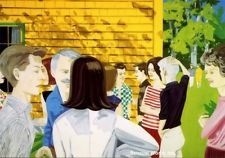 Enter Alex Katz. Katz painted the flat images himself – he took what would be emotionally fueled images (his wife mainly), and habitually painted them, turning them void of emotional content, and simply colors and composition. I’ve often wondered how on earth he has been so lauded over the years while focusing on some of the most saccharine and least favored contemporary subjects – family and flowers. Lucky you Alex. Returning to my crayons etudes, I still can’t imagine anyone truly appreciating the flat color studies of my own children. Katz’s pieces were HUGE too – no intimacy whatsoever. Billboard-size paintings of his wife Ada. I imagine myself for a moment painting over and over my husband. While I love him dearly, he is a source of love for me, and well it’s a perfectly complicated relationship. I couldn’t possibly flatten the depth of our relationship to Tomato Red and Corn Blue. But what if my muses are my family? A muse is a source of inspiration, a guiding genius. Why do artist’s not talk of their muse anymore? I know it has had female and sexual connotations in the past. Perhaps now in the “new post-de Beauvoir, post-Friedan, post-Steinem, post-Irigaray, post-Cixous woman” days we can revisit this term of muse and take it very seriously for what it means. Superb! Big word. Aristocrat! Loaded word. I remain flummoxed at how an artist can render someone so close in such an abstract way. So clean! So ascetic! 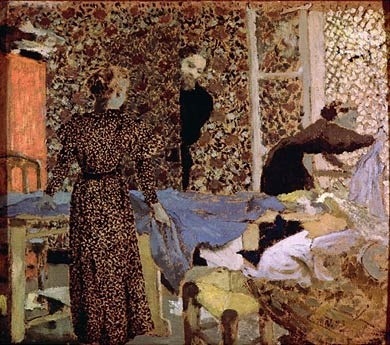 I prefer undoubtedly the claustrophobic, and emotionally wrought domestic scenes of Édouard Vuillard – it just seems more honest. Katz has only one child – perhaps my three children, and being raised in a large family push me into the emotionally dense camp of a Vuillard or Pierre Bonnard. “Interior of the Work-table”, 1893, Édouard Vuillard. I do however think that some of Katz’s paintings of parties really hit the proverbial nail on the head – given the locale, suburbia or otherwise, and the context, party with nontneccesarilyfriends – the shallow graphics of the images are perfect, or to use Storr’s word, superb. So perhaps in my next crayon sitting with the kids, I’ll draw a lawn party, barbecue or tupperware party in Manatee Gray, Wild Watermelon, Razzmatazz Red, Cornflower Blue, Neon Carrot and Asparagus Green.